The world loves Apple Computers. No matter how much critique they get, it’s just enough to go to one coffee shop and look around to count how many Macs you will find. Anywhere you go, you can see the glowing or matte apple logo on the back of the laptop screen. Apple’s design language of creating elegant, beautifully designed and impressively well-crafted laptops have earned them a place in people’s hearts. So, we get it why you don’t want to give up on your Mac to use specific software. The good news is: you don’t have to! There is plenty of payroll software that works well with Apple computers, and this is why we are here. We will take a look at some of the best payroll programs for Mac Computers. Patriot Payroll. Patriot Payroll Software is an affordable, robust, and reliable cloud-based payroll and accounting solution that works on PC and Mac alike. Intuit Payroll. Intuit Payroll is an affordable but powerful payroll program that comes loaded with features and automation capabilities to let you process payroll and pay your employees easier and faster than ever. ADP Workforce Now. ADP Workforce Now is an online HR application that’s best suited for small to mid-sized businesses. 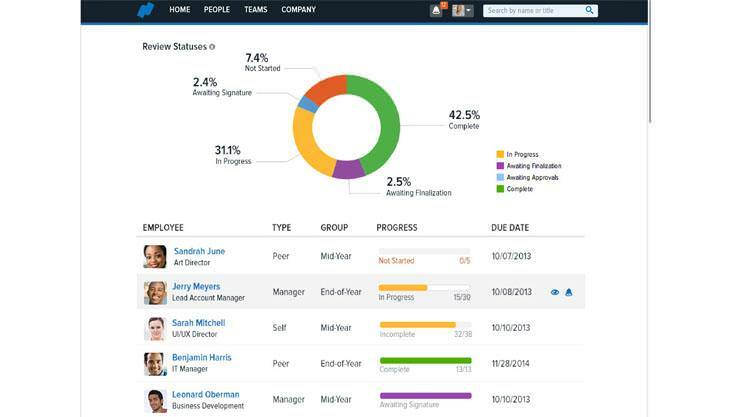 The solution can automate all of the HR processes of your business into a single dashboard, including payroll. Namely. Namely is a comprehensive human resources solution that combines payroll, talent management, and benefits administration in a single suite. Patriot Payroll Software is an affordable, robust, and reliable cloud-based payroll and accounting solution that works on PC and Mac alike. The app is user-friendly and easy-to-use. The solution is so simple that you don’t need any training to start using the platform. Patriot Payroll is designed to help small businesses properly invoices their customers and monitor and handle receivables and payables. It allows enterprises always to know what their financial standing is and be able to project income in the future as well. The solution offers an essential online payroll service that can simplify the way you pay your employees significantly. Setting up the Payroll service is much more comfortable than one would expect it to be, and you can always get help from customer support when you need it. Once you finish the set up of the Patriot Payroll Software, you need to enter your employees working hours and let the software do the rest. It will do all the calculations, and you are guaranteed 100% accuracy, every time. You can process as many payroll transactions as you need, and once the processing is done, you can print paychecks in a minute. You can even pay your employees via direct deposits. 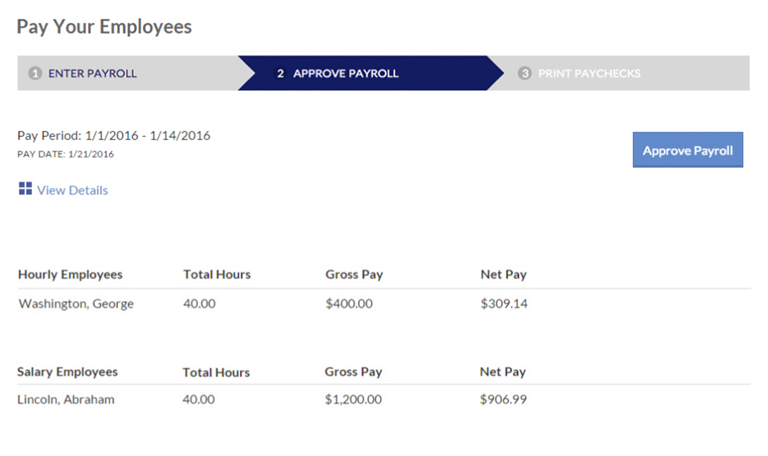 1- Basic Payroll - $10/mo. Patriot’s payroll gives you options. You can have a basic payroll to save you valuable time and money, or you can have a full-service payroll that has everything you need. You get to choose what you need. The solution is intuitive and user-friendly enough for anyone to pick it up and start using it right away. No training is required, and the setup only takes minutes. 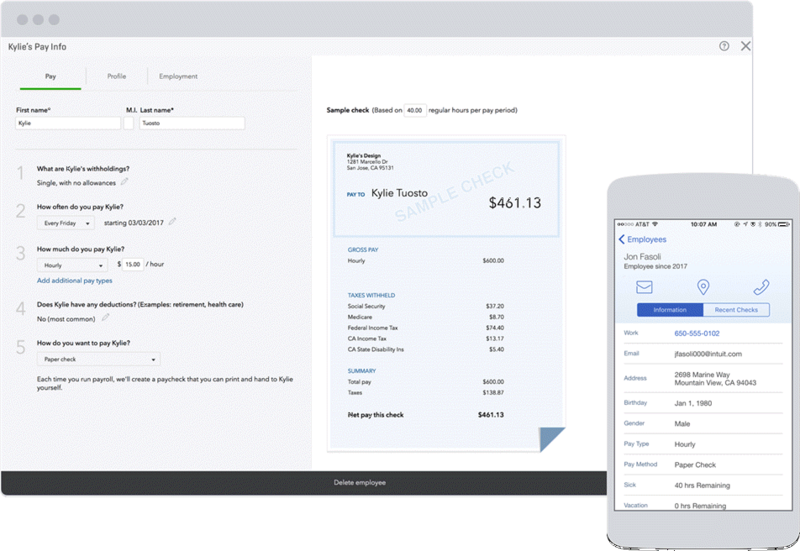 Intuit Payroll is an affordable but powerful payroll program that comes loaded with features and automation capabilities to let you process payroll and pay your employees easier and faster than ever. The software can do payroll calculations, perform taxes calculations, and generate as many paychecks as needed – in seconds! The payroll service Intuit offers is not only about Payroll tools and functionalities, but they extend to help you manage your employees more efficiently. The system brings hiring tools and tips as well to help your business access valuable business advice as well as guides so you can attract and acquire top talents. Intuit also offers one of the best customer support services on the market, with top class expertise on even the most complicated matters. You can rest assured that when you call with questions, they will have the answers you need. 1- Basic Plan: $20/mo. + $2/employee/mo. 2- Enhanced Plan - $31.20/mo. + $2/employee/mo. 3- Plan - $79.20/mo. + $2/employee/mo. Intuit Payroll offers a free paycheck calculator that takes away all the inconveniences of calculating payroll taxes and makes figuring the paychecks of both your hourly and salary employees more comfortable than ever before. Intuit’s Payroll Software main goal is to help you pay your employees on time and with no errors. A goal many would argue that it does achieve. The solution allows you to create unlimited paychecks instantly and calculates payroll taxes in no time. Intuit is well known for their superb customer support. Anytime you face an issue, and you can pick up the phone and have an expert on the other end guiding you step-by-step through the solution. You can also find help via online chat. 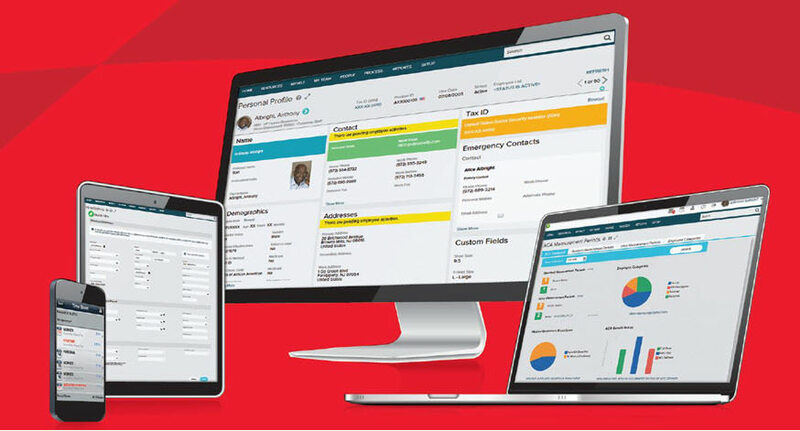 ADP Workforce Now is an online HR application that’s best suited for small to mid-sized businesses. The solution can automate all of the HR processes of your business into a single dashboard, including payroll. ADP Workforce Now will allow you to manage all your employees’ benefits as well as generate insightful reports with the click of a button. The benefits administration features are, of course, all compliant with annual reporting requirement for IRS forums 1094 and 1095. The solution provides a benefit plan creation wizard which can be easily configured to the onboarding process of the company. You can learn even more about the features of ADP Workforce Now in this ADP vs. Paychex vs. Paylocity Payroll service comparison. ADP Workforce Now doesn’t offer an official pricing list, so you will have to contact them for the details. However, according to some users, pricing starts at $62/month. ADP Workforce Now handles benefits management like a boss. It comes with a dashboard for reporting purposes such as status and confirmation reports, deductions, beneficiaries, covered dependents, enrollments, and coverage levels. ADP Workforce provides you with insightful analytics in real-time. The solution allows you to create customized reports, charts, graphs, and spreadsheets. This analytics can help users make informed decisions at the right time. ADP Workforce Now doesn’t only give you useful data in real-time, it even makes this data more useful by showing you where exactly do you stand when compared with your competitors as it shows you your standing against benchmark data collected from thousands of businesses. Namely is a comprehensive human resources solution that combines payroll, talent management, and benefits administration in a single suite. It is a very simple and straightforward solution that is designed to simplify and accelerate HR processes and workflow. Namely provides users with a unified location where they can manage all their HR Data, and the solution is customizable as well to fit into the already-existing workflow of any business. The system is also scalable so it can grow with your business and you never have to go through the painful process of changing solutions. The provider offers top-notch customer support that can help you with anything at any time. Similar to ADP Workforce Now, no official pricing list is offered by the vendor. If you want the pricing information, you need to contact the company, and they will provide you with the details. However, according to some users, pricing begins are $12/mo. And you should be aware of some additional costs such as the implementation fee. Namely can keep all HR and Payroll data in synch automatically. It can also update benefits, handle W-2s, 1099s, and other forms of yearend reporting simplify filling with payroll taxes, help you stay compliant with the law, and more. Namely can adapt to your needs and the system of your business quite quickly thanks to the customizability of the solution. Users can control not only how the platform looks, but how it performs as well. Namely is a fully-featured, modern, all-in-one HR solution that can meet all your HR needs and more! The solution comes with features such as Custom profiles, social newsfeeds, employee database, analytics, organizational charts, auditing, calendar, and workflow automation. As you can see, there is no shortage of options. We tried to give you as many details as we could in a limited space about four of the most commonly used payroll software for Mac which we think Mac users are going to like. You can also take a minute to learn about the Best Accounting Software for Mac, or the Best Mac Time Tracking Apps in 2018. If you have any questions, feel free to leave them below, and we will get back to you. If you found this article helpful, why not share it with a friend who might find it useful as well?